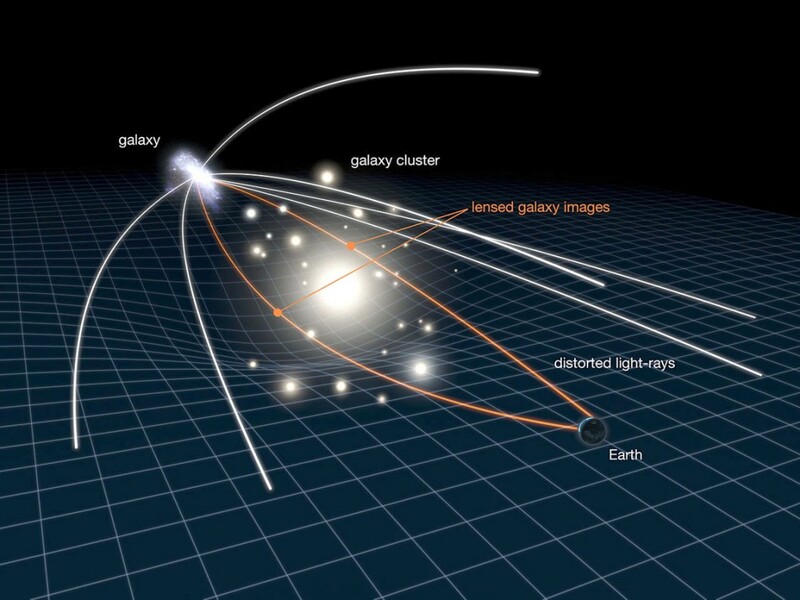 A direct consequence of Einstein’s theory of general relativity, and an observational way to prove it, is gravitational lensing. It requires a powerful gravitational source to work, such as a galaxy or cluster of galaxies. It works in a similar way to a lens of glass, where rays of light are bent toward a single source, increasing the brightness. In this case, instead of glass, the bending of the rays is due to the curvature of space. Light rays coming from the source would otherwise miss Earth, but instead are bent toward us when there is a massive object in front of it. It’s a concept that allows us to see galaxies near the edge of the universe, far more distant that other galaxies and clusters. Using computer algorithms, astronomers have found ways to take the distorted image from a gravitational lens, and piece it into a useable image that can be studied. More often than not, the galaxy doing the lensing is not perfectly aligned with the source and/or the Earth, giving a strange lensing image. But if they are aligned perfectly, we can end up with what we call an Einstein ring. The image above shows the lensing of a distant galaxy by a massive foreground galaxy. To the left of the closer galaxy, there is a small companion galaxy that is contributing to the lensing effect we see. 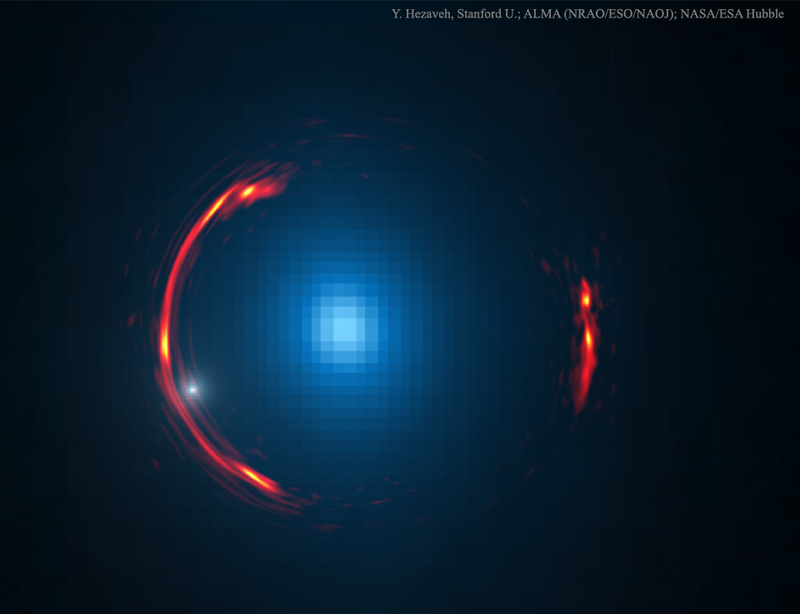 The image is created by combining infrared observations of the nearby galaxy from the Hubble space telescope in blue with radio wave observations of the distant galaxy from the Atacama Large Millimeter/Submillimeter Array (ALMA) in red. The benefit to studying lensing events like this is that by looking at how the distant galaxy is lensed, we can learn about the mass distribution of the closer galaxy. One of the important things astronomers have learned from the above image is that the small companion galaxy has a large amount of dark matter, contributing to the idea that satellite galaxies in general are dim and full of dark matter. It’s almost like using the galaxies of the universe as giant telescopes to see even further. Throw in a bit of sound gravitational theory, and you can learn a lot about what’s out there.